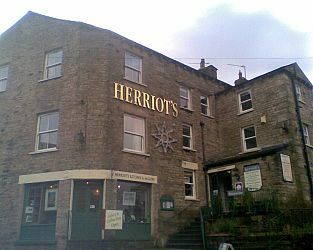 Centrally located in the traditional market town of Hawes in Upper Wensleydale, owners Glenn and Liz Payne welcome you to their Guest House / B&B - Herriot's in Hawes - in the heart of the Yorkshire Dales. Visit Hawes North Yorkshire and the surrounding villages and stay in bed and breakfast, hotel or vacation rental accommodation provided by BedPosts members. Hawes is a good centre for touring upper Wensledale and it lies higgledy-piggledy against the slopes, with a beck scurrying through. The setting of Hawes is more note-worthy than its individual buildings; there is a particularly attractive view of Hawes on the road to Hardrow, about 1 mile across the valley to the north. Hardraw Force is a waterfall cascading 100 ft over a limestone ledge. A footpath passes behind the waterfall. The road to the north leads over Butter Tubs Pass. The Butter Tubs, though not the largest of the Pennine potholes, are certainly the closest to any road. A wild road south of Hawes leads high out of Wensleydale, past the tiny cottages and waterfall of Gayle towards Langstrothdale and upper Wharfedale, with fine views of Ingleborough and other peaks. The rough track leading off the road to the east, 3 miles south of Hawes, follows the route of the Roman road leading to Bainbridge; the track passes within a few strides 0f the summit of Wether Fell (2015 ft). If you seek accommodation near Hawes in North Yorkshire you have come to the website of a “club” of providers who offer affordable quality accommodation around UK in hotels, bed and breakfasts, guesthouses, inns, and restaurants plus self-catering cottages and apartments .